REOPENED: The Esmirada Group has rebranded Bodega Y Tapas to Amuse but decided to revert back to the old name, Bodega Y Tapas. Winter Solstice. Hookerlily and I (Wise Guy) were excited to come to Bodega Y Tapas because it sounds similar to my favorite brand. It took me some time to find it as I took a detour via Orchard Hotel Shopping Arcade. The fastest way: walk straight down from Palais Renaissance and past Delfi Orchard. It’s just below TAB. You can’t miss it. At first glance, you can already tell how well-planned it is. On the lowest level, along the sidewalk, the outdoor dining is a smoking area. The veranda is non-smoking. Inside the gastro-bar itself, there are three areas: around the bar counter; a dark cosy corner with dark wood and leather armchairs (very mafia-like); and bar tables and stools of a contemporary design in front of the bar counter. Impressive organization. 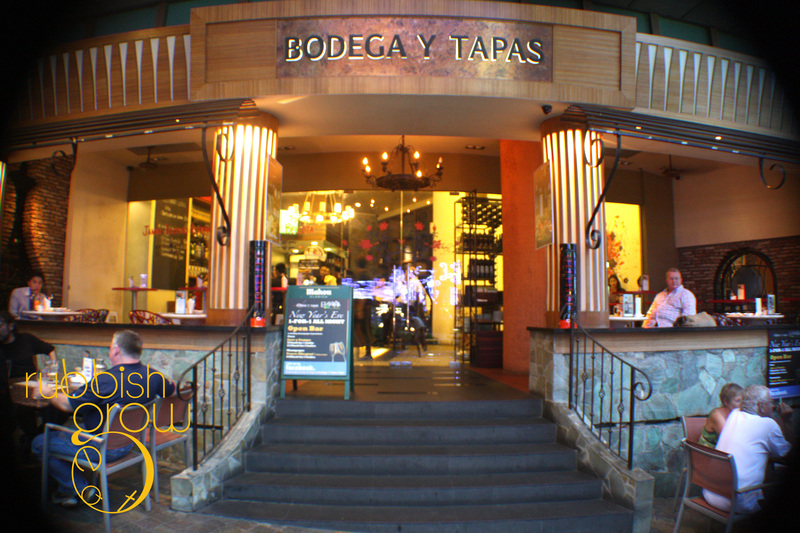 Bodega means “winery” in Spanish but it also serves tapas, small portions of savory Spanish food–did I mention this is what hipsters would call a Spanish gastro-bar? 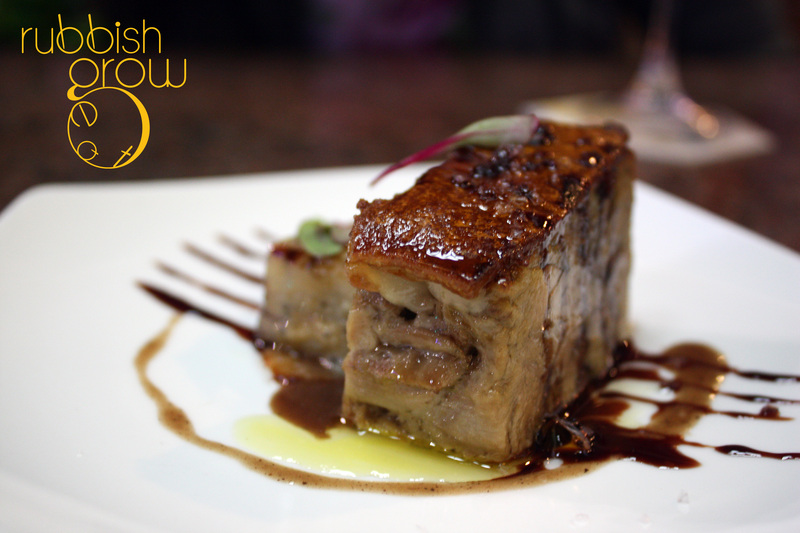 Lunchtime (12pm-3pm) is most worth it: pick 3 tapas for only $20. For preprandial drinks, Hookerlily had strawberry margarita ($16) while, at a Spanish place, I always order Sangria Tinto ($14). Hookerlily said she didn’t like the margarita, overly sweet and syrupy. I just ordered without looking at the drinks menu, so Sangria Tinto is the traditional Sangria with brandy and cut-fruits. It was refreshing and easy to drink. However, I like Sangria to be carbonated–more fun that way–and should have ordered the Sangria de Cava ($16), cava being a Spanish version of champagne. My bad. 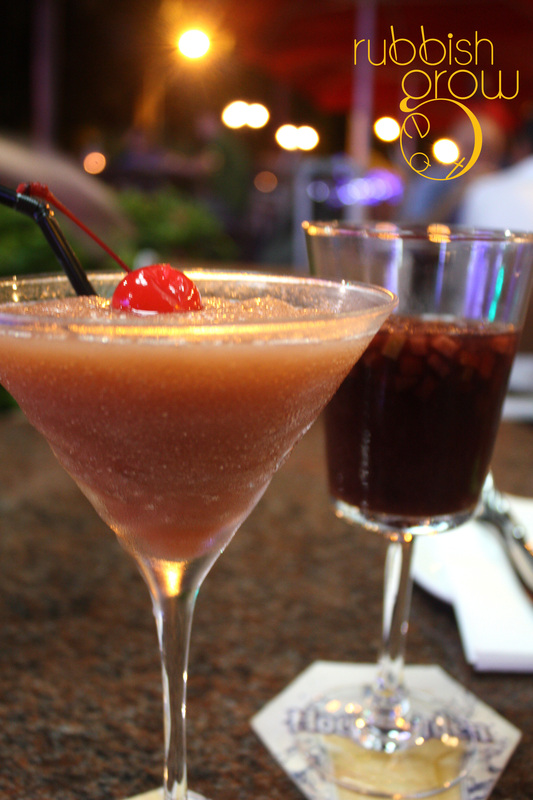 Do you know the English word “sanguine” came from the Spanish word “Sangria,” meaning “blood”? That’s why most sangrias use red wines, instead of white. I made that up. But hey, it may be a true story. Suckling Pig ($21). Show-stopper. The serving was small–the size of two pieces of kueh lapis–but what gorgeous plating. Meat was taken from all parts of the pig and slow-cooked for two days before compressing under a lovely, crispy piece of skin. Although it had a porky taste, it was sweet with the sauce, tender and had a great balance of fats and meat and surprisingly, not as greasy as it looked. The potato gratin was divine with the cheese completely melted into one with the potato. An expensive but delicious dish. 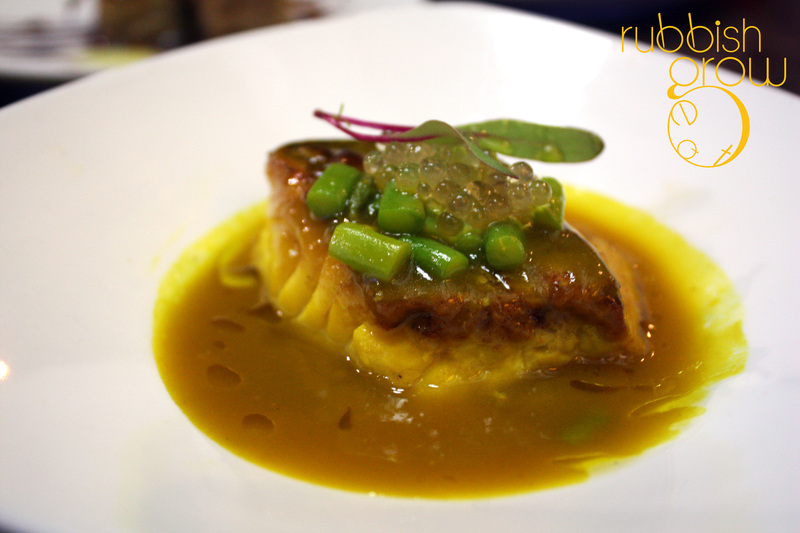 Pan Fried Chilean Hake (fish) in Cava & Saffron Sauce ($14). We love atas sauce, Spanish champagne and the most expensive spice in the world? Bring it on! Unfortunately, we thought the serving (1/4 of a palm) was tiny even for tapas. Either we were not used to the flaky texture of Hake, a cod fish, or it wasn’t fresh enough to be befitting of the sauce. Huevos Rotos ($15). 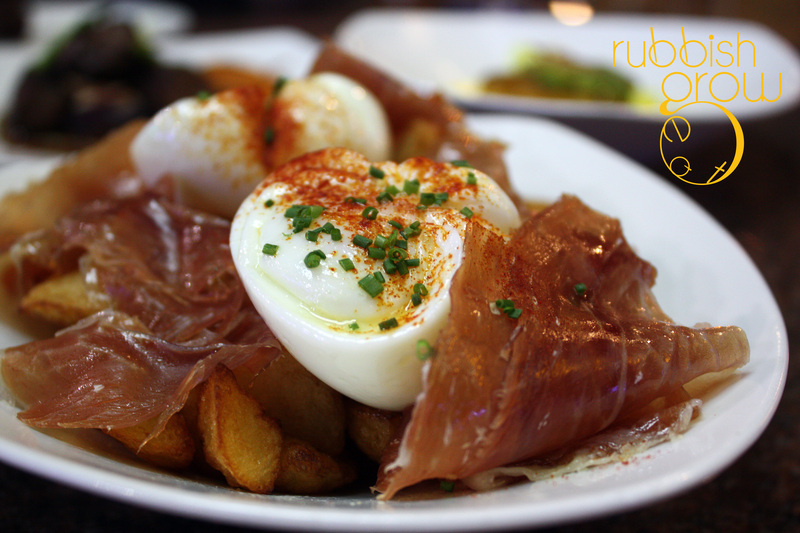 A very traditional Spanish dish of potatoes, poached eggs and serrano (ham) slices. Put the ham aside, and mixed the poached eggs thoroughly with the potatoes. Then eat all together. The poached eggs could be more runny but overall, the taste was awesome. The potatoes, coated with yolk, tasted similar to the Indo Mie Mi Goreng seasoning. Strongly recommended. I replied, “It’s artichoke, my dear.” But she was right. Although the texture of artichoke was more like bamboo shoots, the taste was reminiscent of the Chinese salted vegetable. Savory and appetizing. 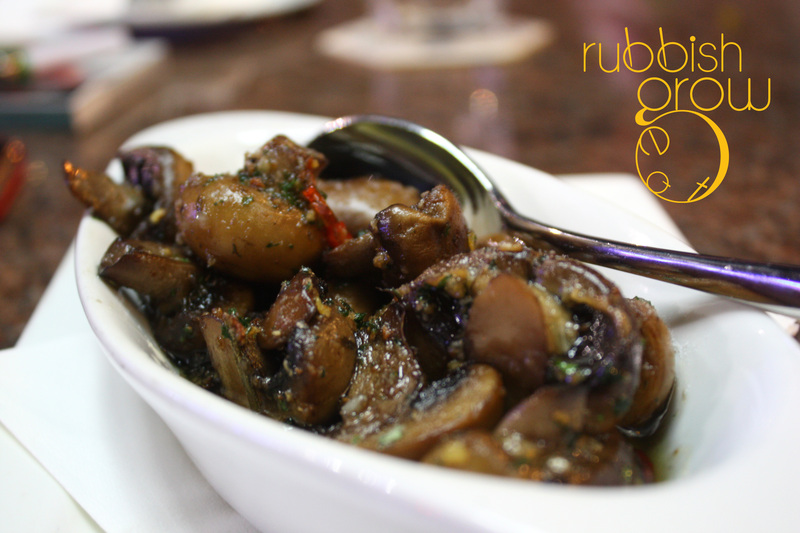 Nothing went wrong with the Sauteed Garlic Mushrooms ($9). We didn’t taste any garlic but we liked that the mushrooms were unevenly coated with salt so some were bland while others salty. This broke the monotony of the dish and added an element of surprise. 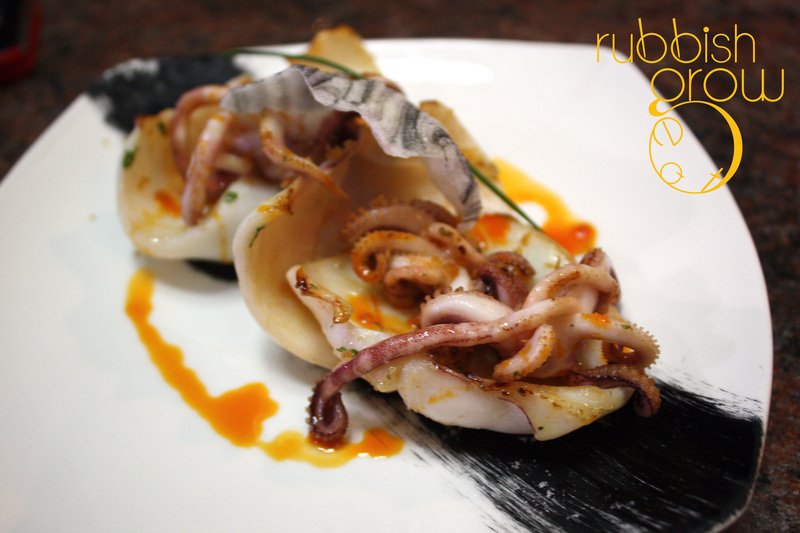 Grilled Squid, Garlic Chips and Pimenton (Paprika) Oil ($13). Hookerlily said, “This looks stunning, like a painting. A bold stroke of brush across the plate.” Although visually pleasing, we thought it was bland even with the black (ink-squid?) sauce. Piquillo Pepper Stuffed with Chicken in Spanish Sauce ($11). “This isn’t how I expected it to be–in a casserole dish,” remarked Hookerlily. Piquillo pepper is traditionally grown in Northern Spain, hand-picked and roasted to give it a sweet, bell-pepper taste although it looks like an obese and stumpy chili. The pepper was stuffed with chicken bits and cheesy mashed potato but there was a distinct sweetness, tasting almost like a cross between mashed sweet potato, mashed potato and the lotus filling in ang ku kueh. The chicken bits–just tiny bits–provided a contrast in texture. I usually don’t like tomatoes because they have an unpleasant harsh vinegary taste but although this dish looked as if it had a tomato-based sauce, it had only a slight and pleasant tinge of tomato. A very delicious dish. Each person should order about 3-4 tapas. 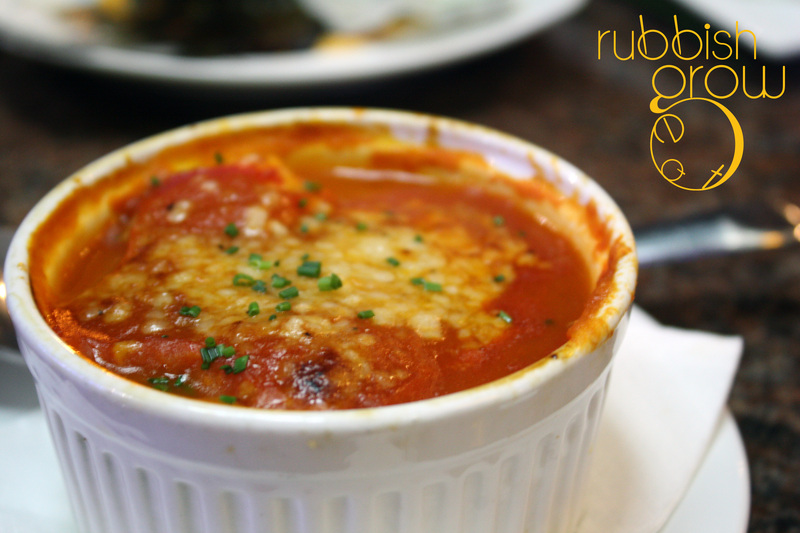 Wise Guy’s Top 3 Recommended Dishes: Huevos Rotos, Rabbit Stew, Piquillo Pepper. 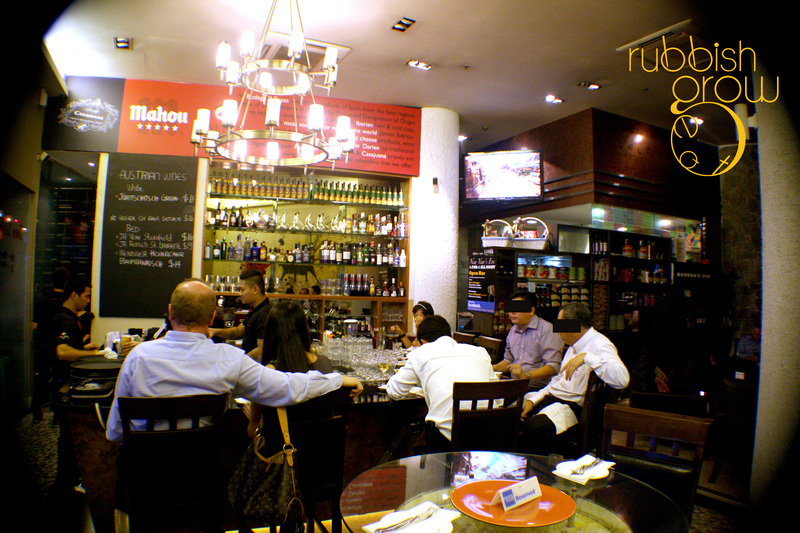 Service: It was not easy to get the servers’ attention sometimes because the place was bustling. (Reservations highly encouraged.) The servers were extremely busy, always taking orders, serving food, clearing tables so I don’t fault them. More servers should be hired. When you can get to the servers, you’ll find that they are affable and helpful. Ambience: The gastrobar gives off a different vibe than the rest of Orchard. Very relaxing, and a fiesta atmosphere. Not a romantic date place, but I saw many expats and many bros hanging out in exec wear. Definitely a after-work place to chill, drink and eat. Coming here is an eye-opener to me. 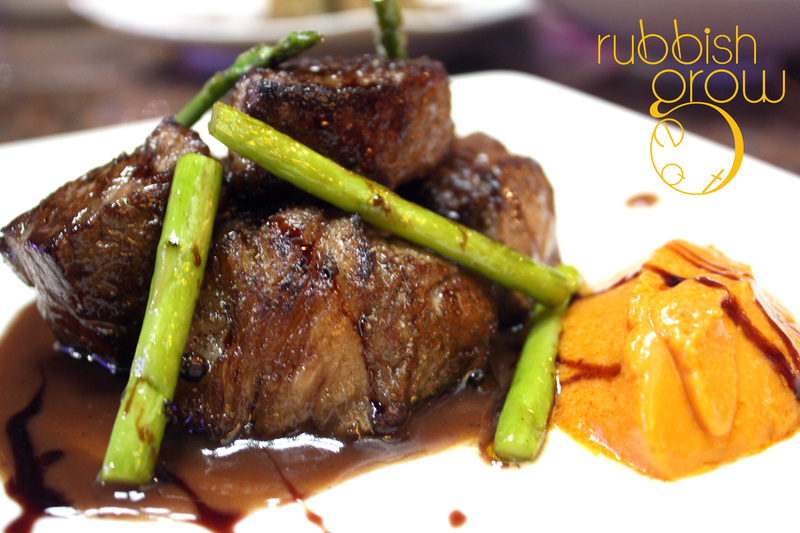 This is authentic Spanish food with authentic Spanish ingredients that is hardly found anywhere else in Singapore. Sometimes we thought that the food was light and not salty enough but on the whole, the potatoes were extremely well done and the sides were delicious. Scrumptious sides are important because they show how much effort was put into every aspect of the dish, and not just focusing on the main ingredient. PS: RERG thanks Fransisca and June for their kind hospitality. I could see this restaurant while being on the bus passing by orchard, thx for this intro, looks like a place worth checking out. Yes, yes! You can see it by the road. 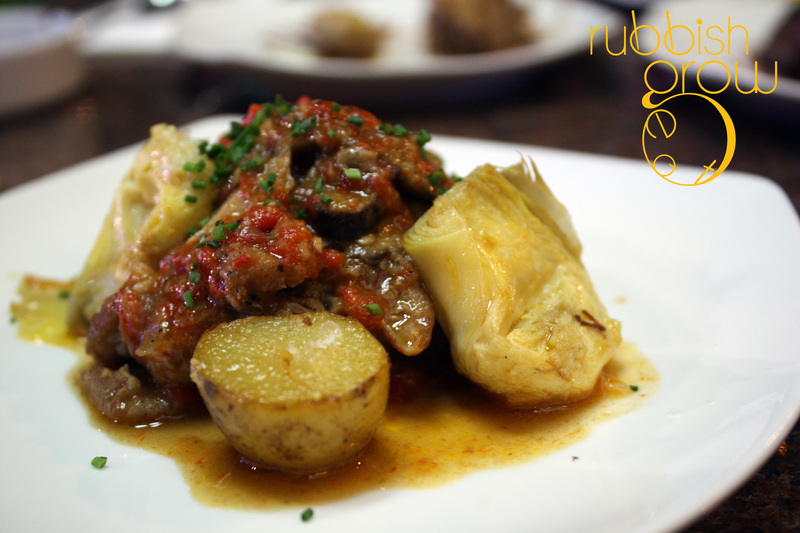 It’s authentic Spanish food, but very different from what Singaporeans are used to. And it’s slightly expensive. But the food was an eye-opener and taught me a lot about Spanish culture. You can tell what sort of people they are by the food they eat.